Mirror Mirror On The Wall, Who's The Bluest Dog Of All? 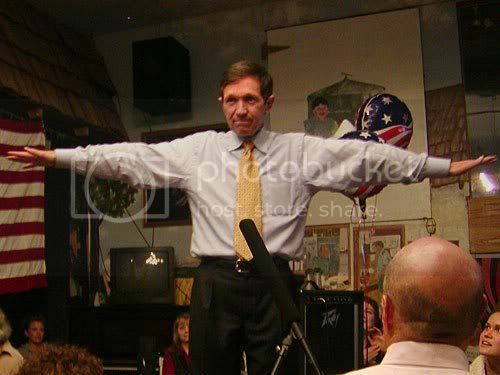 Could it be the sainted One True DemocratTM Dennis Kucinich? Sure, why not? The Ohio congressman's vote Saturday night against against the health care bill is just the latest in a long series of votes that have found him voting with the Republicans and the so-called Blue Dog Democrats. Of course Kucinich and his small but noisy fanclub always respond that the Blue Dogs vote the way they do because they're corporatist and evil while DK votes his principles, which are pure and just. Well, nonsense. A vote on landmark legislation is a Yes or a No. It isn't an essay question. And if following your principles results in voting the same way as Michelle Bachmann, your personal holiness meter might need calibration. Kucinich and his groupies often refer to themselves as "progressives". In fact, they are nothing of the sort. They are utopians. They act as if by refusing to compromise, by rejecting the possible and demanding the perfect, we will someday wake up in a magical world where it never rains on weekends and bacon grows on trees. Their politics of holiness have never achieved any important goals and never will.